In some ways, that fear has served me very well. I’ve been able to harness my fear and anxiety and weaponize it to result in a pretty prolific body of work. 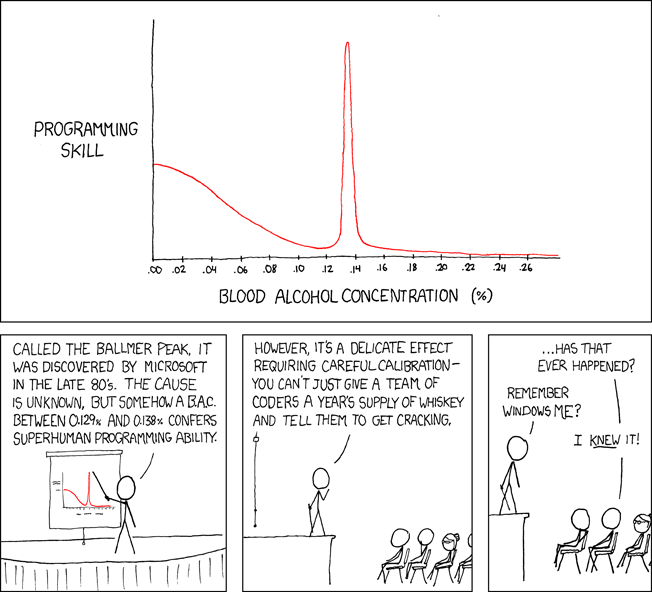 I’ve even joked that I am in constant pursuit of my own “Ballmer Peak” that replaces “Blood Alcohol Concentration” with anxiety and “Programming Skill” with general productivity. And while that fear has driven me to accomplish a lot, it has also held me back in terms of taking risk. I’ve been slowly writing a piece called, “two entrepreneurs walk into a casino…” that is a real-life story of a friend and I going to a casino on Friday night and doing everything we could to de-risk our risky “investment.” I think that is the true tale of many successful entrepreneurs and investors; they de-risk everything they possibly can to limit their downside and bet on things with high potential upside. But the pure, unadulterated fear of failure has historically led me to mitigate and opt out of many potential risks (even being personally vulnerable) and in doing so, held me back. I’m excited to start living that philosophy.